Time really flies as a mom. The best way I've heard it described is: the days are slow but the years are fast. And it is sooo true. The days drag on with screaming, fighting and now that they're older, negotiations. But man the years fly. My baby girl turned three last week and started her first day of preschool on the same day. She is the total opposite of her brother. Fearless, brave, and without any anxiety or worry. We brought her to school, she hugged and kissed her big brother (not even us...) and walked in without looking back. My heart sank for a moment. Just a moment though. Because I still remember all the crying and pushing away we had to do on my son's first day. Actually I was pregnant with her (a day away from giving birth) on my son's first day of pre school, so I guess it has come full circle. I cried that day seeing him so upset to watch us leave. And as my last child walked away from us and onto her big girl journey, I was proud and a bit sad. She didn't need us... but at the same time...SHE DIDN'T NEED US! FREEDOM! Well, freedom for 3 hours. (She only goes to school half days) Which is just enough time for me to bake her Very Strawberry Unicorn Birthday Cake! It was hard trying to find a Strawberry cake recipe that didn't have a ton of sugar or used jello. JELLO!? It just felt wrong. Until...I saw this recipe from A Cozy Kitchen. It was for a sheet pan cake, but works pretty nicely as a layer cake. I also thought this cake was interesting because it used egg whites in it, but they weren't whipped. You just mix it with milk and pour it in. So much easier than using another mixing bowl, whipping and folding it into the batter. So as soon as I got home I roasted up 2 cups of strawberries with a bit of sugar. Once they were done, it gets whizzed up in a food processor till it becomes a puree. Set that aside to cool. Onto the cake. Butter and sugar are beat together in a stand mixer for 2-3 minutes. Then you add the rest of the ingredients, alternating between the dry ingredients (Cake flour, baking powder, and salt) and the wet ingredients (Strawberry puree, buttermilk, and vanilla). And thats it really. It makes the most beautiful strawberry scented cake batter. Divide these up between two 9 inch cake pans and bake for 25 minutes. Allow these to cool before frosting. Now I made some meringue swirls to use as the unicorns hair, because I thought they were pretty and I love love love meringues. So to do this, I whipped up 4 egg whites with some cream of tarter, sugar and vanilla till I reached stiff peaks. I then divided the egg whites into three bowls and whisked in three different gel colors. I then filled three pastry bags fitted with the Wilton 3 color coupler set and piped meringue swirls and stars onto a parchment lined sheet pan. This went into the oven for 1 1/2 hours to dry out. once dry and crispy, allow to cool in the oven. And finally the frosting. Whew, birthday cakes are ALOT of work! But this one was totally worth the smiles. I made a cream cheese frosting, but to bump up the strawberry factory, I crushed up some dehyrdrated strawberries (you can find them at Trader Joe's) and added them to the frosting. It created a great speckled look and tasted amazing with the cake. Once the cake has cooled, frost the layers and decorate with the meringues. I reserved about a cup for frosting and dyed that a light blue just to pipe a couple more stars around the meringues and around the bottom of the cake for a more finished look. I didn't get a chance to take a really nice pic of the cake slices since we seriously scarfed it down immediately. (My kids are monsters when it comes to cake!) And this one honestly tasted like the best fresh strawberry ice-cream in cake form. Just one note about the cake decor. The Ears, horn and eyes are cardboard cutouts with pics attached that I placed into the cake. I'm not much of a fondant fan so I prefer these cute little piece of stick in decor. Saves you a bit of time as well! I got the adorable piece from Amazon. Link is below! Preheat the oven to 350 degrees F. Add the sliced strawberries to one side of a parchment-lined baking sheet and sprinkle about 2 tablespoons of sugar. Toss gently lay out the strawberries into a single layer. Roast for 10 minutes. Remove and allow them to cool for about 5 to 10 minutes. Add the strawberries to a blender/food processor and blend until smooth. Set Aside. In a medium bowl, add the cake flour, baking powder and salt. Whisk until combined. Set aside. To the bowl of a stand-up mixer with the paddle attachment, add the butter and sugar. Beat until light and fluffy, about 2 to 3 minutes. In a measuring cup, pour in the buttermilk, egg whites, vanilla extract or paste and reserved 1/2 cup strawberry puree (discard any extra) and whisk until combined. Turn the mixer to low speed and, alternating between the dry ingredients and the liquid ingredients (the strawberry/egg white mixture), add the them butter/sugar mixture until the batter is relatively smooth. Pour the batter into the prepared baking pan and transfer to the oven to bake for 25 minutes, until a skewer inserted into the center comes out clean. Allow the cake to cool in the pan for about 5 minutes and then invert onto a cooling rack and cool. In a stand mixer start whipping egg whites with the cream of tarter. Once it starts getting foamy, add vanilla and slowly add the sugar, 2 tbsp at a time. Whip until still peaks. Then separate the whipped egg whites into 3 bowls. Add desired amount of food coloring to each bowl and whisk in. Fill pastry bags and pipe swirls using a star tip. For the Frosting, beat the butter and the cream cheese together in a stand mixer fitted with the paddle attachment. Beat for 2-3 minutes until light and fluffy. Mix in the vanilla and powdered sugar, 1 cup at a time. Starting slow then on medium to avoid a huge sugar dust cloud in your kitchen! Once the sugar is mixed in take the bowl out of the mixer and gently fold in the crushed dehydrated strawberries. Frost the cake by placing 1/3 of the frosting on the first layer of cake, Topping with the second layer and frost the rest of the cake all the way around. If using the unicorn ear and horn pics, place these into the cake then place meringues on top as the unicorn mane, More in the front and then some leading to the back of the "head". 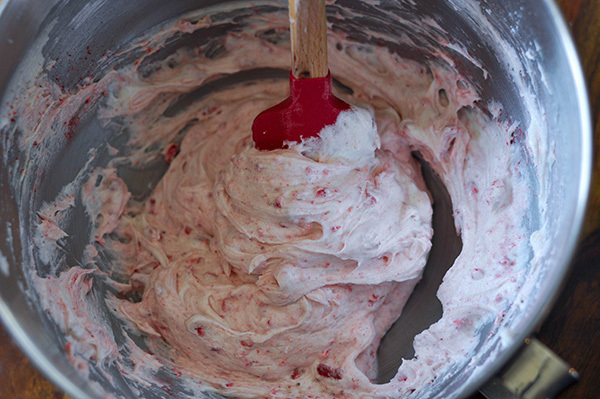 If desired, reserve about a cup of cream cheese frosting before mixing in the strawberry powder. Add a bit of blue gel coloring to the reserved frosting, and using a star tip, pipe the frosting in between the gaps in the meringues on top of the cake.